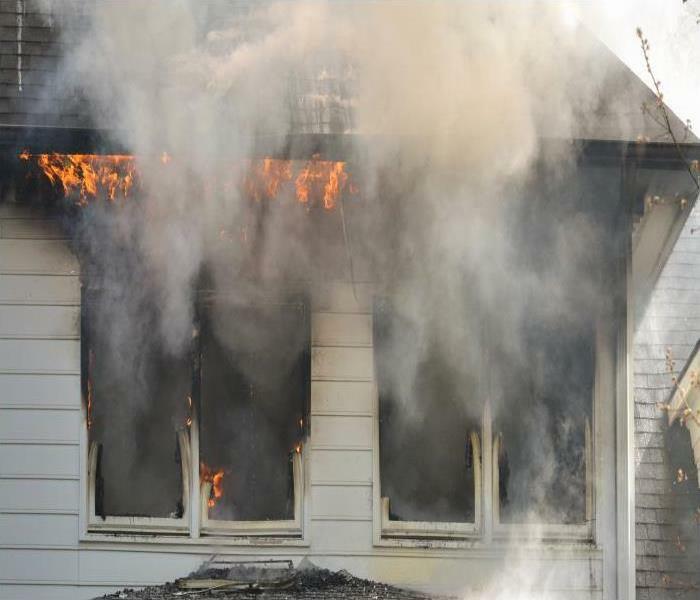 When a fire damages your home, it is best to react quickly and call in professional help. Team SERVPRO is standing by 24/7 to take your call. When we get a call requesting an emergency response team to a residential fire, our technicians get to work immediately diagnosing where the smoke went. Sometimes homeowners tell our technicians that the fire was in a limited area of a room, but unless contained, soot particles and smoke residues can get transferred to other areas of the home and require treatment to eliminate odor-causing particles. While remediating fire damage in Miami, our technicians may contain areas by using clear, poly sheeting over doorways and vents to stop the spread of soot any further in the home. We track the probable path of the smoke and test for the types of residues we are dealing with. There can be different types of residues in a single area, and each requires a different cleaning method to be effectively removed. 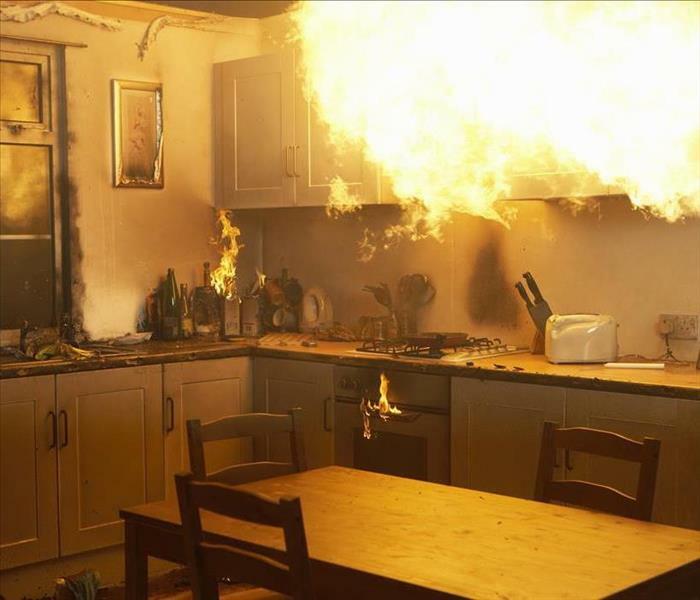 For example, frying a frozen turkey is extremely dangerous, yet 900 homes are damaged every year according to the National Fire Protection Association. When the ice from the turkey hit the hot oil, the ice becomes steam and expands to over 1500 times its original volume resulting in a massive flash fire. 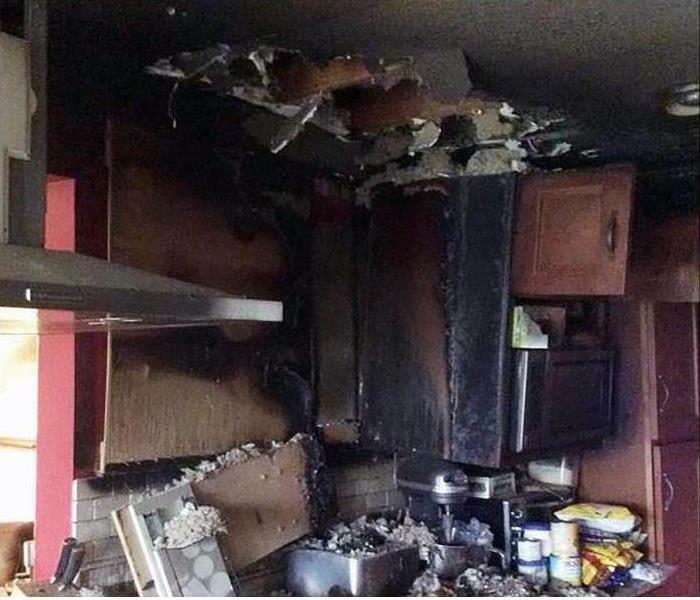 The result can be smoke residue from a protein fire from the turkey which leaves little in the way of visible residue and a considerable amount of pungent odor, wet residue from synthetic or rubber everyday kitchen items in the area and dry smoke residue from burned wood and organic building materials. SERVPRO technicians address each type of residue with their knowledge of the cleaning methods needed. Wet smoke needs a wet sponge treatment to lift the greasy, heavy residues. While dry smoke does not need to be wet and dry sponge methods are used to lift it away from surfaces. After a fire odors may be an issue that thorough cleaning does not completely eradicate. Our technicians have equipment such as thermal foggers and hydroxyl generators to completely neutralize all traces of smoke smell. If any building materials are beyond restoration, we offer a complete line of building services to return your home to its preloss condition. SERVPRO of South Miami has emergency response teams available 24-hours a day by calling (305) 269-8900. No matter if your fire damage is large or small, we can clean up, eliminate odors and rebuild. Click here for more information about the city of Miami. Our certified technicians are available 24/7 to help you get back to business after fire damage. You as an area entrepreneur enjoy the benefits of the community’s support through Business Improvement District of Coral Gables and a growing core of loyal local customers and visitors. The vibrancy of the Miracle Mile/Downtown Gables Shopping District depends on innovative dining and retail spaces. If your business falls victim to a fire everyone suffers. Our mission is to assist both the business owner and our bustling downtown through our high-quality remediation services. Fire damage to your Coral Gables commercial property requires fast and professional restoration. Whether the damage is unnoticeable from the outside or created a gaping hole along the row of neighboring shops and restaurants, you need experts who trained for this type of disaster and hold multiple certifications in remediation strategies that are sure to get your business back on track. The SERVPRO team responds day or night, year-round. Our service vehicles arrive with the experienced project managers ready to assess and plan, the products and equipment needed to clear and clean, and the technicians poised to get to work. Firefighting efforts and sprinkler systems make the first task water removal and structural drying. Safety and structural integrity concerns require a clear view of the damage, elimination of slip-and-fall and electrical shock hazards, and evaluation of any surface weakness caused by the fire. Because SERVPRO is a full-service restoration company, we accomplish this phase with skill and speed. Soot residues vary depending on the materials consumed. If your business is a restaurant expect thin, varnish-like coating that SERVPRO technicians use abrasive or solvent-based products to loosen. Retail clothing inventory smolders, leaving a thick, sticky residue we remove with cleaners enhanced with wetting agents or surfactants. Paper and wood burns fast with ashy debris we dry sponge and vacuum to remove. Businesses that close even temporarily due to disaster risk permanent shuttering. SERVPRO’s rapid response using industry best practices ensures your storefront or bistro in the city “Where Beautiful Lives “is back serving customers before your reputation takes a hit. SERVPRO of South Miami stands ready to help your fire damaged business regain its footing swiftly. Call us at (305) 269-8900 after the firefighters leave to get remediation and restoration tasks rolling. To learn more about the Coral Gables adult 50+ services click here. SERVPRO of South Miami is ready to tackle fire damage and smoke odor in your rental property. If you have a rental property, you know that all sorts of accidents happen, including fire damage. The time between the fire department extinguishing the fire and the arrival of our technicians should be as little as possible. The faster we can start restoration and cleanup efforts, the more of the home and tenants' possessions that can be saved. First and foremost, ask the Fire Department if it is safe for the tenants to remain in the house. When you contact SERVPRO to address fire and smoke odor damage in your Coral Gables property, the technician gathers as much information as possible, so we know the right resources to bring to the site. If tenants remain on premises, we also ask them to limit movement and avoid areas with fire damage, so soot particles do not spread outside of the original area through foot traffic. Why SERVPRO? We are local to this area of Florida and can arrive Faster to Any Size Disaster. No matter when a fire happens in your rental property, you can expect an immediate response from our technicians to mitigate damage to both building and possessions. SERVPRO technicians work in teams to expedite the cleanup process. 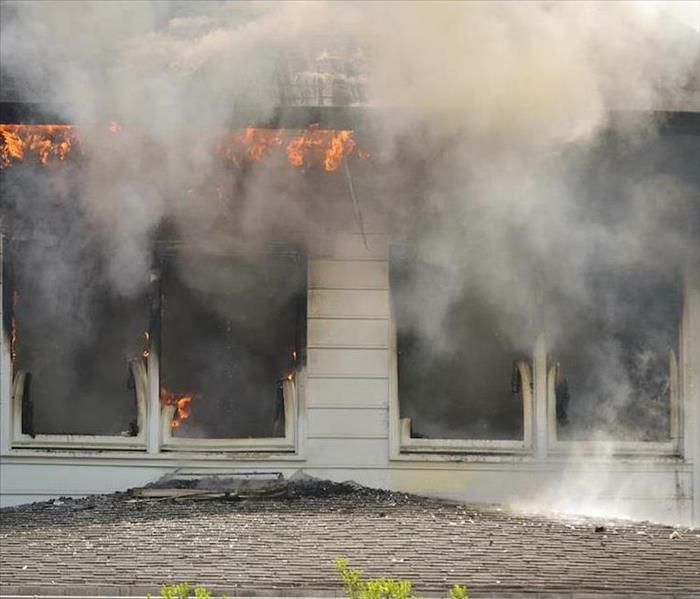 While one group extracts any residual water from extinguishing the fire, other technicians are determining the spread of soot and smoke in the home and determining if containment is necessary. Other technicians tape off registers and ensure the HVAC is off; the ducts are cleaned of soot particles during the sanitizing process to stop the return of foul odors. Our IICRC specialists wipe down surfaces and non-porous possessions. Depending on the type of smoke residue, they can choose different solutions and utilize wet and dry sponge techniques as needed to remove all traces of smoke and soot effectively. Smoke can leave deeply embedded odors that our Odor Control Technicians eliminate through multiple applications ranging from air scrubbers with charcoal filters to thermal foggers to neutralize stubborn odors. SERVPRO of South Miami is ready to tackle fire damage and smoke odor in your rental property. Our specialists are available at the time you need us, seven days a week. Get started now by calling (305) 269-8900. A call to SERVPRO of South Miami represents peace of mind. It is hard to imagine that a home in Coral Gables could catch on fire. Most houses on the tree-lined streets of the City Beautiful have stood there for decades, braving thunderstorms and hurricanes, seemingly unmovable by the elements. However, it is precisely their longevity that makes your home vulnerable to malfunction with old wiring that could cause a fire in your property. Even when it seems like a small event contained to just a part of your house, reaching out to a specialized team can make all the difference. When there is fire damage to your Coral Gables property, our SERVPRO team is close by and readily available to help restore your home. Our team is on call 24 hours a day 7 days a week with the goal of reacting as soon as the emergency takes place. The longer the smoke residue and water remnants sit on your home, the more widespread the damage can be. Taking fast action can make all the difference in returning your home to mint condition. Upon your call, our SERVPRO Green Fleet arrives at your home to assess the damage and determine the path of the fire. With this information, we're able to plan for immediate needs and anticipate any long-term consequences. Our wide array of equipment is able to extract any water left after firefighters extinguished the flames home and return moisture readings to their appropriate levels. We also focus on identifying the different surfaces affected by smoke and soot with the goal of applying a material-specific solution for their removal. Due to our formal training as well as our on the field expertise we can make a work plan focused on cleaning your home while salvaging as much of its contents as possible. Many of our SERVPRO customers worry about the smell of smoke left after a fire. It can feel like upholstery, rugs and the very walls of your home can not lose the offending odor. In reality, we are trained to tackle the issue in different ways. Depending on the specifics, our team may use air scrubbers to rid the air of the offending particles, or we may bring in an ozone generator to alter the air molecules and break down the smell. For more extensive odor removal we may use air filters specifically designed to purify the environment in your home. Don't let water damage take over your home, call SERVPRO for help. The “City Beautiful” truly lives up to its name. With its shaded streets, lush with vegetation, it is a pleasure for those who live, work and play in the Gables. Many of its homes retain the beauty of their original construction, and it is easy to see the history that lives within each of them. However, older construction brings some challenges to modern life. Water damage caused by a burst older pipe is not uncommon within this beautiful community. Whether a tree root made its way into the plumbing or it just broke due to age, calling an expert team to restore the home to its mint condition is essential. If there is water damage to your Coral Gables home reach out to SERVPRO immediately and avoid any further damage to your property. Every minute counts when your floors and walls are covered in water. The longer it stands on surfaces such as original wood floors or saturating your walls, the more extensive the damage to your home. Our SERVPRO team is available 24/7 to respond expediently to your emergency. As a homeowner, it is hard to tell just how much water has made its way in to the foundation of your house. Our Green Fleet is equipped with the latest technology to extract any standing water and to monitor moisture levels in your home. Our handheld equipment allows us to enter into crevices to extract water and dry them, while heavy-duty pumps can eliminate larger accumulations. 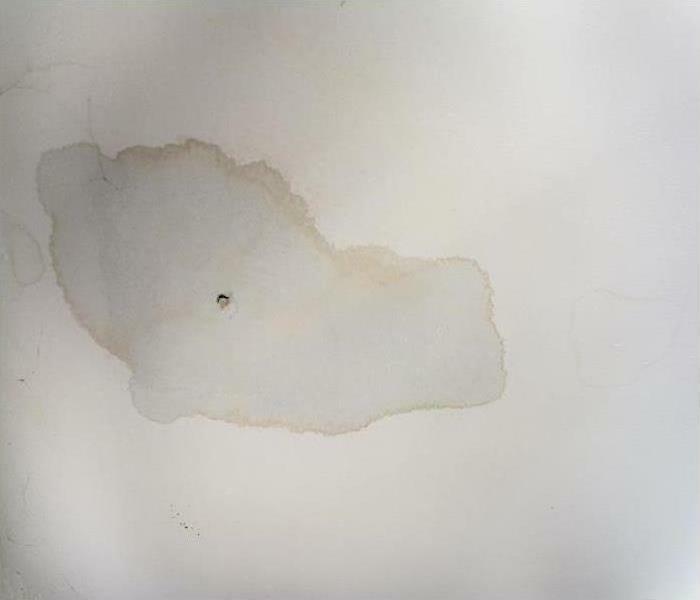 In Coral Gables, the possibility of mold following water damage is especially worrisome because of the age of most homes. Our SERVPRO technicians are specifically trained and IICRC certified to mitigate the proliferation of mold in your home and to remediate any that might exist. Keeping the right levels of moisture by using air movers and dehumidifiers allows us to achieve just that. Our expertise also prepares us to work rapidly to avoid the buckling of hardwood floors, all by maintaining the right level of humidity in your home. You can always depend on the fast response of our highly-trained SERVPRO of South Miami water restoration technicians. Storm damages are a common concern for Miami residents. When severe systems develop and make landfall in the area, they can arrive with a destructive force capable of quickly damaging condo roofs and siding. While the structural damages alone can be problematic and require an immediate response from licensed contractors, the vulnerabilities of the roof can allow runoff and direct rainfall to enter your condo unabated. Preventing this damage might initially be inevitable after roof damage amid a severe weather event, but our professionals can help with fast mitigation solutions and effective restoration strategies. 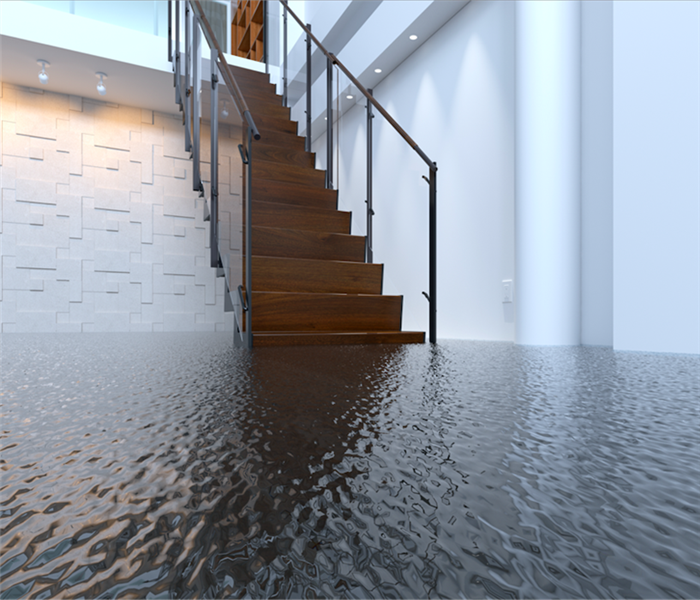 When flood damages occur in your Miami condo, time is of the essence to get the water removed quickly and the saturated materials dried. The longer that these effects persist, the less likely preservation of these damaged elements becomes. Our SERVPRO team can arrive with fast extraction equipment like our truck-mounted pumps. These machines can remove water from your property at a rate of 300psi, which can quickly allow our technicians the opportunity to set up drying equipment in your water-damaged condo. Mitigation after a flood involves many steps, but the first of these are emergency board up services. This preventative action can keep further water flow from coming from the damaged roof area until reconstruction efforts can safely begin to this exposed area of your property. When flooding affects your condo, you have a finite amount of time to protect the structure and the contents of your property from irreparable damages. You can always depend on the fast response of our highly-trained SERVPRO of South Miami water restoration technicians. Give our crew a call anytime that you need us at (305) 269-8900. Fire destroys property fast, and in different ways, so complications can always arise in any restoration process. Knowing which steps to take immediately after the fire is put out can help ease the process. Working with our IICRC certified restoration technicians can help restore your Coral Gables home to preloss state easily. Putting out the flames does not mean the end of fire damage in Coral Gables. In many cases, the fire creates an opportunity for other damages to arise. For example, if the blaze is fierce enough to puncture a hole in the roof or walls of the house, it creates an opportunity for weather elements to ruin the property further. Even in small fires, secondary problems can arise. For example, moisture from sprinklers or the water used by firemen to quell the blaze saturates surfaces it sets smoke residues. Our SERVPRO technicians help prevent these secondary problems by boarding up the affected structure immediately. We also bring water extraction and drying equipment to loss sites to help combat moisture problems. Bad odors are typical after a fire incident. It can manifest if there are aerosols and other smoke residues in the air. Various residues deposited on surfaces also tend to produce pungent odors especially when synthetic materials, fuel oils or proteins are burnt. Such smells can only go away after removing the residues. Our SERVPRO technicians clean all affected areas. We also use different procedures to deodorize the property. For example, fogging the area with neutralizers, sanitizers, and digesters helps because the best way to get rid of smells is to replicate the conditions that caused them in the first place. It is not always possible to salvage items damaged by flames. The fire damage on drywall, ceiling or other organic materials might be too extensive for restoration to work. Replacing such materials helps deal with the damage effectively. Our SERVPRO technicians are well-versed, with the teardown, build up and refinishing processes needed in such areas. Restoring fire-razed property can be a tricky process. Call SERVPRO of South Miami to help determine the best steps to take. You can reach us at (305) 269-8900 any day. We’re Faster To Any Size Disaster. Need a passport for an upcoming trip, click here for more information. Holding a pool party for your friends might sound like an excellent way to socialize but could lead to mold damage. 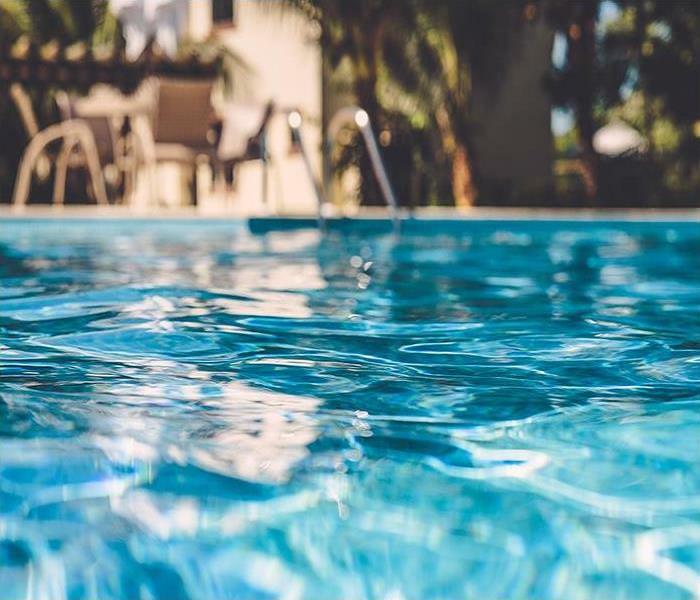 Holding a pool party for your friends might sound like an excellent way to socialize in Coral Gables, but tidying up takes time afterward. Not only must your home get a good cleaning, but any areas left damp from showering and changing out of wet swimwear needs a thorough drying session. Running the exhaust fan in each bathroom can help. When airing out locations left damp, or even drenched, mold damage in your Coral Gables home can take hold. SERVPRO can help prevent the further spreading of microbes and get your home's interior environment back under your control. Mold and mildew do not require extreme elevations of humidity to become active, so we find it crucial that we restore normal levels of moisture in your home first. We dry out your home's damper areas with desiccant machines and search for trapped moisture that can seep out and feed microbes. When materials become inundated with microbes, they often become too damaged for us to restore. We enclose such areas with heavy-gauge plastic sheets. With an air scrubber and flexible tubing, we eliminate microbes and spores from the space as we cut mold-damaged materials away from your home's framework. Because plastic also holds in moisture, bags that might harbor mold in the case of forgotten wet laundry from the pool also work to keep moisture and microbes from escaping as we pull ruined drywall from your home. Before anything leaves a negative pressure chamber, we double bag it and knot it to keep everything securely inside. We can then remove these safely to the outside of your home. Treating once-moldy areas with antimicrobial liquids that dry fast keep mold from coming back again. This and keeping a dehumidifier on hand for future parties can keep your home free of mold infestations. We can help you choose one that you can easily control and use. When You Experience A Flood Damage Emergency In Your Coconut Grove Home, The Team To Call Is SERVPRO! After storms blow through Coconut Grove, the flooding often recedes quickly. The effects on condos, duplexes, and other homes can remain for weeks, however. If not cleaned or restored quickly, further damage can happen as well. So why SERVPRO to remove flood damage from your Coconut Grove home? Our company trains each specialist to the standards required by our industry, we maintain an extensive, restoration equipment inventory, and can take the initial steps to return your home to its original condition. SERVPRO teams cannot guarantee that a cleaned carpet is safe to use again, so we recommend immediate disposal, rather than expend the labor hours to attempt restoration. Quick removal also reduces the effects flood water has on the flooring underneath the carpet. While completing disposal actions, other team members begin disinfecting and drying the home. Specialists spray any surface affected by the flooding with an anti-bacterial chemical and allow it to dry. Next, they clean each surface to remove soil, and other contaminants left by the receding water and allow them all to dry once again. Our goal at SERVPRO of South Miami is to restore each home to a clean, dry condition as quickly as possible. 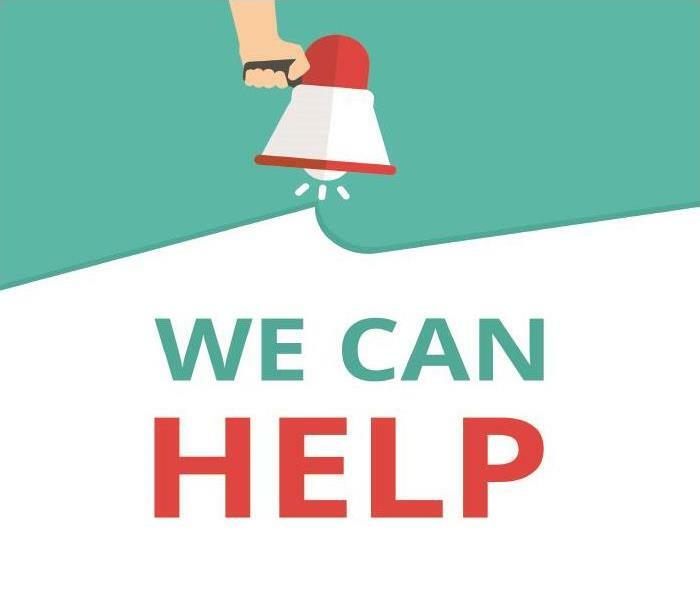 If you need us, call (305) 269-8900 today to get started. We are here for you. Click here for more about Coconut Grove. Call us at (305) 269-8900, any time when you find your home's interior drenched. It only takes one of the many storms passing over Kendall to create problems with your home's roof. After repairs, most homeowners never have a problem again. Sometimes, though, minor gaps that went undetected before now suddenly seem to open up and let rain from even mild showers into the house. Any part of your roof can develop problems like this. When your Kendall home experiences water damage, the team at SERVPRO is ready to help. We can help determine where the leak is coming from so your roofing team can get the repairs made as quickly as possible. We use thermal imaging equipment that shows the presence of moisture in materials, letting us track down both lost and invasive water, revealing their origination points. While the top of your home requires experts in roofing, many times we can repair leaky pipes and slipped water lines. SERVPRO of South Miami is ready 24/7 to help families in Key Biscayne, Coconut Grove, and Coral Gables protect their property from invasive rain with our water cleanup services. Call us at (305) 269-8900, any time when you find your home's interior drenched. 1/23/2019 - When You Experience A Flood Damage Emergency In Your Coconut Grove Home, The Team To Call Is SERVPRO!